Small Loans (UK) - Instant Decision - 97% Approal rate. On average Swift Money® approve over 97.5% of all small loan applications. Small Loans With An Instant Decision. A small loan can be defined as a short-term loan ranging from £50 to £1000. Small loans are available to people who need to take care of small unexpected expenses that are not usually catered for in a typical monthly budget. Unexpected expenses can catch you off guard a few times a year. Although such expenses may not be significant, they can cause you a lot of stress if you don’t have a provision for them. Small loans are ideal for settling unexpected dental bills, car repair bills, urgent home repair bills, funeral expenses, etc. When faced with such expenses, you don’t need to take a huge loan repayable over a long period of time. Furthermore, it can be a daunting task trying to access savings in an emergency situation. Small loans are designed for such situations. 1. Payday loans - Payday loans are among the most popular small loans in the UK. The loans are available to employees or individuals with a source of income who would want to borrow some money for a few days to a month. Payday loans are usually repaid in one installment although it is possible to get flexible terms when you choose reputable companies like SwiftMoney. The loans are fast and easy to access today because they are available online. Payday loan interest charges/fees have been capped by the FCA. Ideally, you can never pay more than the amount you borrow (as total interest and fees). Payday loans are perfect sources of short-term cash when you are sure you will repay your loan in a month since you won’t accumulate unnecessary fees/charges. If you need a short-term loan repayable over a longer period, stay away from payday loans. 2. Personal loans - You can take a small personal loan to cater for an emergency expense. These types of loans have terms ranging from three months to two years. You can take a small personal loan when you need more time to repay. Ideally, small personal loans are easier to manage. The loans are also suitable when you need a higher loan amount. While most payday loans have a loan amount limit of £1000, it is possible to access more money when you take a small personal loan. The loans also attract a lower default risk since they offer more time and monthly repayment costs are usually lower. Small personal loans also have shortfalls. For instance, they tend to be more expensive when compared to payday loans since borrowing costs tend to be higher over extended periods of time. The loans are also subject to different rules, unlike payday loans. While the price/interest/fee caps for small, short-term loans like payday loans are known, the cost of most small personal loans is subject to the lender. Your chances of being overcharged are higher when you choose small personal loans over payday loans. 3. High street loans - The UK has an abundance of high street loan providers like pawnbrokers offering small cash loans for emergency situations. High street loans can be a great solution for your short-term cash needs if you have pressing local financial commitments. Since high street loans are available in almost all high streets in the UK, it is possible to visit a provider and get a loan on the same day. You should, however, expect to pay more. High street loans are more expensive than small loans like payday loans by the mere fact that you have to visit your loan provider in person. You also need some form of security to qualify for a high street loan. The loans can also be inconvenient if you don’t live near a high street loan provider. 4. Guarantor loans - Guarantor loans are small cash loans ideal for short-term cash emergencies when you don’t have a regular income. If you are unemployed for instance and you need some money to pay for an emergency medical bill, you can turn to guarantor loans for help. Most payday loans are given to individuals who are employed. When you need money, but you don’t have a job, you can turn to a guarantor to help you secure a loan. A guarantor is an individual who guarantees loan repayments on another person’s behalf. Your friend or family member can be your guarantor. Guarantor loans are perfect when your ability to repay a short-term loan is in question because of factors such as unemployment. The loans are also ideal when you want a higher loan amount compared to that offered by most short term loans. The loans, however, come with restrictions. First and foremost, you must find someone who agrees to repay your loan on your behalf if you are unable to meet the repayment obligations for whatever reasons. The guarantor also needs to have a good credit score/credit history for you to increase your chances of securing the loan. You also risk hurting your relationship with your guarantor if you are unable to repay the loan. Furthermore, it can take days to get a guarantor loan. Most people turn to small, short-term loans like guarantor loans when they are unable to secure favorable alternatives like payday loans. SwiftMoney payday loans are extended to anyone who can guarantee repayment. You can be unemployed and still get a payday loan from SwiftMoney. Talk to us to understand your options. 5. Credit card loans - You can use your credit card to get a small loan for emergency expenses. Credit cards are great sources of emergency cash if you already have them. If you don’t, you need to wait for days or weeks to get a credit card. When you have an unexpected hospital bill to pay, you don’t have the luxury of time. Credit card loans are also great if you are sure you can repay the loan within 30 days. Credit card charges can build up very fast over time if you surpass the 30-day limit. Credit card loans are also rigid. While it's possible to get flexible payday loan terms at no extra cost, the same can’t be said about credit card loans. 6. Line of credit - Lines of credit allow borrowers to borrow a certain amount of money within a certain limit. Lenders offer lines of credit to customers interested in borrowing the amount of money they need at a given time. Lines of credit are readily available, however, they tend to be more expensive than other small, short-term loan options like payday loans given factors like; interest is charged daily. You also need to have an established relationship with a lender to qualify for this type of small loan. Lenders also check factors like credit rating before approving line of credit loans. Most small loans in the UK today can be applied for online. You can apply online directly from the lender or through a broker. Applying for a loan directly from a lender is great if you have a preferred lender in mind. Brokers come in handy when you want to compare offers and get the best deal. The first step to consider when applying for a small loan is the application process. The process should be simple if you choose a company like SwiftMoney. Our small loan application process is simple and fully automated. You just need to fill in your personal details and choose your preferred loan amount and terms. Once to hit submit, we will access your application and reject or approve. We have a loan approval rate of 97%, so you don’t have to worry about qualifying for a small cash loan when you choose us. Why are small loan applications rejected? Your loan application can be rejected because of a typo, an omission or inaccurate/false information. To increase your chances of getting a small loan, make sure you fill in your application accurately. You also need to meet the eligibility criteria. For instance, you need to be a UK resident over 18 years to qualify for most small loans in the UK. You also require a UK bank account, regular income or a guarantor. Lenders also reject loan applications because of affordability. You should be able to repay the loan amount you choose comfortably. Responsible lenders conduct affordability checks. If you fill in your application as required, your chances of getting a loan are very high. Based on the information in the application, SwiftMoney will find you a lender who is likely to offer you a loan. Our loan applications are seen by our trusted panel of lenders only. The process is fast and secure. You fill in one application but get access to multiple suitable lenders increasing your chances of getting a loan. You may be required to send more information or documentation before your loan application is approved. This usually happens when you don’t submit the required supporting documents in your initial application. Such an occurrence can waste precious time. For this reason, read your application carefully and submit all supporting documents. Once your application is approved, you should expect to receive your loan amount within a few minutes if you choose us. SwiftMoney sends small cash loan amounts like payday loans within 10 minutes after approving applications. The money is sent to the preferred payment option chosen in the application. Most small loans in the UK today are repaid via CPA. In a CPA (Continuous Payment Authority) process, borrowers give lenders permission to deduct repayments automatically, as agreed, when you get the loan. Most small cash loan lenders deduct repayments every month after payday. The deduction arrangement can, however, vary from one lender to another. Loans are accompanied by loan agreements which must be read and understood. The agreements contain everything you need to know including charges. Interest charges vary depending on the lender you choose. However, for small loans like payday loans, interest charges are set. This is one of the main reasons which make payday loans the most popular small loans in the UK today. Interest and fee charges for payday loans are capped by the FCA at 0.8% of the loan amount daily. The total charges are capped at 100% which means you can never pay interest and fees that exceed the loan amount regardless of the term of the loan. 1. Regulatory approval: Before you choose any small loan provider in the UK, you should make sure they are approved by the FCA. All FCA-approved lenders have a reference number. Such lenders have met the required legal and professional requirements to operate as lenders in the UK. 2. Loan approval rate: Most people apply for small loans to cater for emergency costs. Choosing a lender with a high approval rate will ensure you don’t waste your time. 3. Affordability: The FCA has set a cap on interest and fees charged on small loans such as payday loans. Nevertheless, some providers are more expensive than others. It is important to do your research first before you settle on a lender. 4. Terms and conditions: You should also choose providers who don’t have hidden fees and conditions. 5. Privacy: The loan provider should also have strict privacy policies. Loan applications contain confidential information which must be protected from unauthorised access. The most reputable small loan lenders have strict data policies that offer applicants protection against problems like identity theft. Small loans are important for funding emergency expenses. As discussed above, some small cash loans are better than others. Payday loans stand out as the best small loans today because they are readily available, fast, flexible and affordable if you choose a great provider. 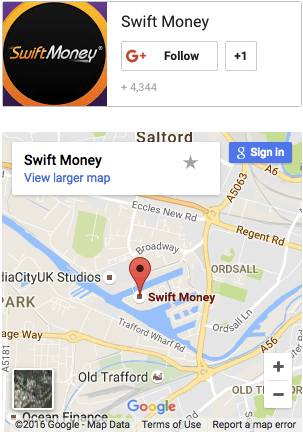 SwiftMoney small loans are accessible to anyone. You can qualify for any of our small cash loans even if you have bad credit. Small loans should be used for emergency purposes only. It’s not advisable to rely on small loans. The loans can become unmanageable when they are misused or taken often. You can avoid being over-dependent on small loans by preparing a monthly budget with emergency provisions and sticking to it. You should also consider setting up an emergency fund.